October 2, 2012 – Bend, Oregon – Born in a mountain resort town, Deschutes Brewery knows what it’s like to be endlessly in pursuit of untouched perfection – chasing pristine powder slopes on mountain flanks. In similar fashion, Deschutes Brewery chased the perfect hops for this new beer – growing heirloom Cascade hops from the original plant strain at Willamette Valley’s Goschie Farms. 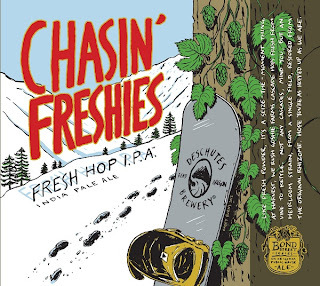 Chasin’ Freshies, which was first brewed at its Bend Brew Pub, is a nod to the snow enthusiasts the brewery has welcomed for the last two-plus decades at its downtown gathering spot. A heavenly IPA that is packed full of fresh specially-grown Cascade hops, this beer is perfect for those who like it bright, deep and fresh. 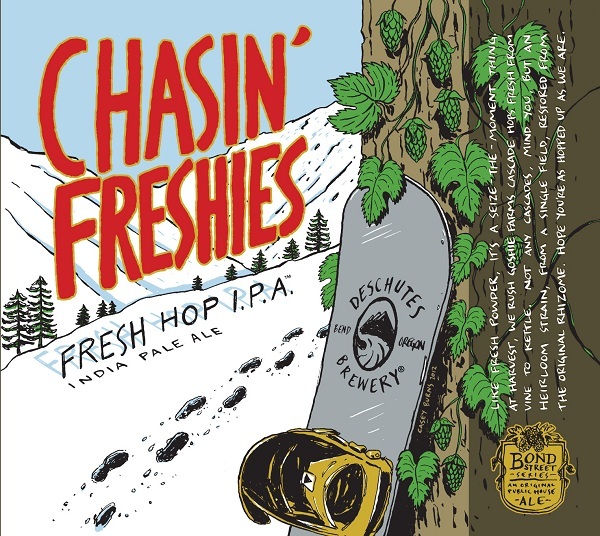 There aren’t any groomers or gapers mucking it up around here – just unblemished flavor..
Chasin’ Freshies is already being poured at the brewery’s pubs in Portland and Bend, and will hit the shelves in most places where Deschutes beer is sold starting next week. Get it when it’s fresh: ‘cause when it’s gone, it’s gone! Don't Forget Tonight's Night Of The Living Ales!